What is the 1/3 rule and what does it mean for my lawn? Known widely as the One Third Rule, lawn grasses should only be brought down each mowing – as the name suggests – by one third of the leaf height at any one time, in order to maintain peak condition. The ‘One-Third-Rule’ has been drummed into many turfgrass professionals and the wider lawn-loving public over many years, but is there any truth to this and where did it originate? It relates to the length of leaf that you should limit yourself to taking off at each mow. The reason behind this is to lessen the stress placed on the grass during the destructive mowing process. By removing only one-third of the leaf during a mowing event, you will limit the amount of photosynthesizing material removed and allow the plant to maintain reasonable growth by minimizing this stress among others. It is also based on the correlation between the percentage of top-growth removed and the subsequent effect this removal has on root-growth. It is little-known that root-growth can be severely impeded, and actually cease for a period of time, depending on the amount of top-growth removed. Research that first introduced this theory was carried out by Franklin Crider in 1955 whilst he was an employee with the US Department of Agriculture that he undertook on pasture and forage-grasses. Three separate studies were conducted within his experiment whereby the amount and frequency of cutting of the grass leaves (forage removal) were compared to root-growth. His first experiment evaluated cutting leaf tissue at different intervals on cool-season turf species and Florida paspalum and bermudagrass among his warm-season grass experiments. The second experiment examined the effects of cutting on root-growth in the field and the last experiment examined different percentages of top-growth removed on different grasses for multiple cuttings. Crider showed that when more than half of the forage is removed from a plant, root growth stops within the first day or two afterward and stays stopped anywhere for a further six to 18 days, with an average of 11 days, depending on the grass-type. 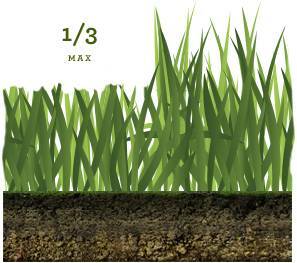 For real-world lawn maintenance, this means that if you were to cut more than half of the top-growth of your lawn grass, at an interval of less than 11 days, the roots would never fully recover leading to greater stresses and eventual decline. Crider also showed in his experiments the effect that a single removal of top growth, in 10-percent increments, has on root growth. When 40-percent or less of the forage is removed, 0-percent of the roots stop growing. However, when 50-percent-or-more of the forage is removed, an increasing percentage of the roots stop growing; and when 90 percent of the forage is removed, 100 percent of the roots stop growing. In other words, leaving more than a third of the leaf at any time the grass is mown during the growing season allows the roots to continue to grow. If the roots keep growing, the plant will remain healthy and perform better than under the stresses placed on it by harder mowing and slower root-growth. His research ultimately proved what was theorised; in that cutting too much leaf tissue off results in the stoppage of root-growth and placing unnecessary burden on the turf. The One-Third Rule has been around for decades and is known to minimise plant stress and should be adhered to wherever practical for your own lawn’s best performance. Consistent mowing height and frequency will always put your lawn in a better position to perform well and overcome the various other stresses that inevitably occur with weather and wear and tear. This article was adapted from the Lawn Solutions Australia website. Click here for more information.